Aimpoint red dot sights have been the tactical choice for law enforcement and military for over 20 years. In any weather or light, a red dot sight allows for quick target acquisition and recovery. Aimpoint 9000: A hunting red dot sight with a traditional rifle scope form factor, primarily designed for magnum actions. Uses standard 30mm scope rings for mounting. Aimpoint CompM2: Night vision compatible red dot sight used by the US armed forces. Waterproof to 80 feet with a battery life of 10,000 hours. Aimpoint CompM3: Also night vision compatible, and offers a 50,000 hour battery life with Aimpoint's ACET technology. Available with 2 MOA or 4 MOA red dot. Aimpoint CompML3: A non-night vision compatible version of the CompM3. 2 MOA or 4 MOA red dot available. Aimpoint CompM4: The CompM4 is also available as the CompM4s, an identical model with a low battery compartment. Includes a killflash anti-reflective device (ARD) and a battery life of over 80,000 hours. Aimpoint Hunter: Hunter red dot sights are designed for hunting. Not having to center the dot in the sight means faster target acquisition, cleaner kills, and a better hunt in almost any lighting condition. Traditional scope form factor makes the Hunter line aesthetically pleasing on any hunting rifle. Aimpoint Micro H1: Lightweight and compact. Available in 1 MOA, 2 MOA, or 4 MOA red dot. Aimpoint Micro T1: Identical to the Micro H1, with a more resilient hard anodized finish and night vision compatibility. Aimpoint Patrol Rifle Optic (Aimpoint PRO): The Aimpoint PRO was designed using input from law enforcement and military professionals. Includes a QRP mount, 2 MOA red dot, and battery life measured in years. 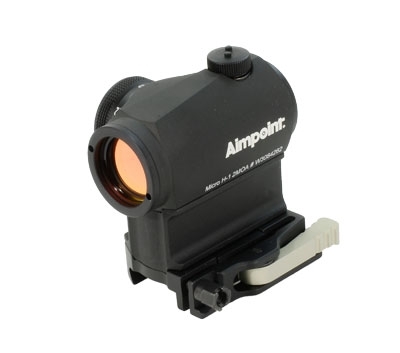 Aimpoint Magnifier: A 3x mangifier suitable for use with all Aimpoint red dot sights.